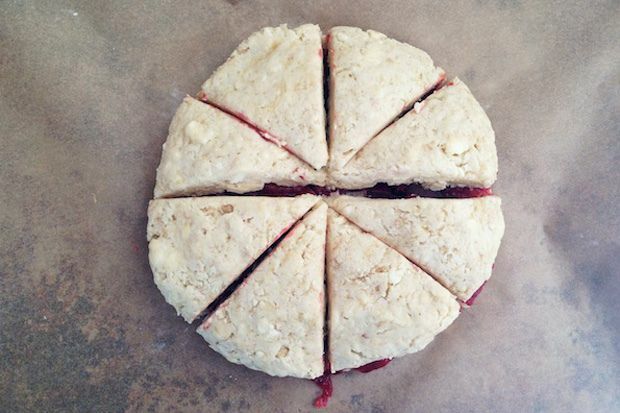 Today: Why, if we choose, we don't need gluten in baked goods at all -- plus a recipe for Buckwheat-Rhubarb Scones. I’m here to tell you that it’s entirely possible to live a good life without gluten. 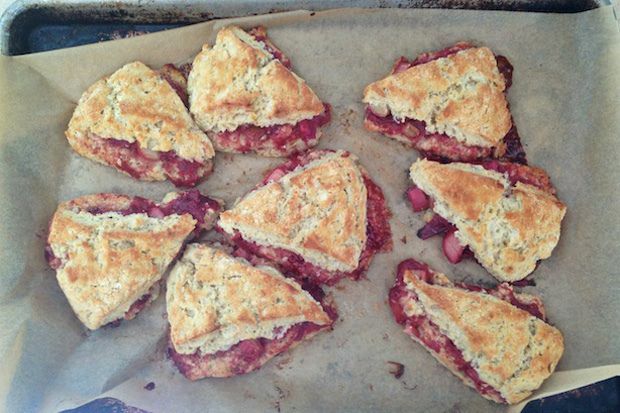 Especially when these Buckwheat-Rhubarb Scones are involved. You see, it turns out that we don’t need gluten to live well. Those of us who have celiac sprue, or non-celiac gluten sensitivity, or gluten intolerance, or any condition that might be improved without eating gluten? We definitely don’t need gluten. (And by the way, that’s a heck of a lot of us in this country.) After eight years of living a good life without gluten, I don’t want it at all. Given how even as little as half a teaspoon of gluten rips through my system and leaves me sick for 3 full days, a Danish made with bleached all-purpose gluten flour looks about as appetizing as a cup of Drano. Some folks who cut gluten out of their lives also cut out grains of all kinds or any kind of baking. Not me. With the help of wonderful mentors and bakers before me, I’ve learned to bake muffins, cookies, cakes, cupcakes, pancakes, waffles, chicken and dumplings, buttermilk biscuits, and apple pie without gluten. For years, I worked really hard to find good substitute flours, gluten-free grains ground into a powder that could fool even the unsuspecting gluten-eater. But in the past few years, I’ve realized something deeper. We don’t need gluten for most baked goods at all. Think about it. When you make a cake, what’s the last instruction from the recipe writer on how to make the batter before you put it in the oven? “Mix until just combined. Don’t over-stir.” I can feel the desire of the recipe writer to throw a few exclamation points in there. Don’t over-stir!!! Why? Because, if you stir a cake batter made with bleached white flour too vigorously, that cake will be tough. You’ll activate the gluten in the batter. Guess what? A cake made with gluten-free flours? There’s no need to fear -- stir away. And when you’re making rhubarb pie, there’s no need to be afraid of the pie dough. You can’t overwork it. If the dough falls apart when you’re putting it in the pan, simply pat it in. If you’re working with cold-enough butter and flour, you’re still going to have a flaky pie crust. Most of the baked goods that home cooks are making don’t need gluten. In fact, I’m willing to say they are better without it. If you find the right combination of flours and use a scale to bake by weight, you can bake anything you might want for a weeknight. Banana bread, since those three bananas on the counter are going black? Grab the gluten-free all-purpose flour mix you have in your cupboard and go. 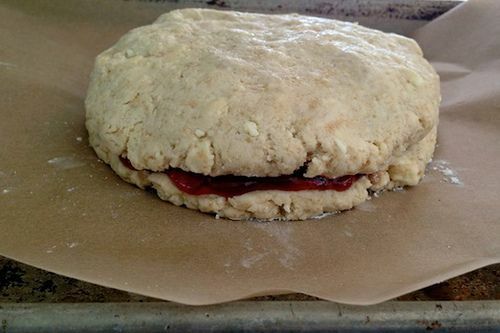 Gluten tends to makes things elastic, which is a quality you might not want in your scones. You want them to be flaky, soft. You want them to be flaky and soft with rhubarb jam and compote. Can you do this while leaving out the wheat flour? You bet. You see, it’s a good life without gluten. Hi! I was wondering what kind of all purpose gluten free flour you use, and if it contains xantham gum or not? Thanks so much for sharing this recipe! These look amazing, and I am looking for a rhubarb recipe to use the stalks I have sitting on my counter. Just wondering, though, if Shauna has a recipe for the rhubarb jam? 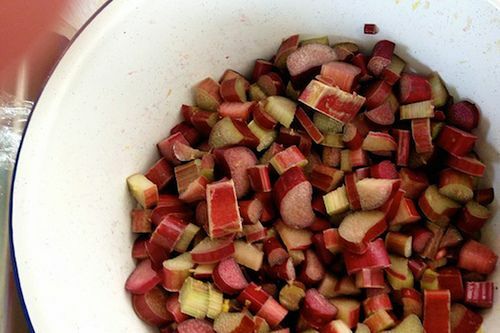 I notice in the pictures that there is a bowl full of raw rhubarb, so thinking maybe she made it herself? Please let me know, since I'd rather not have to go buy the jam to make the recipe. Thanks! I don't have celiac,but I read Shauna's blog because it is filled with gentle humor and deep appreciation of life in all its joy and suffering, as well as love for food--from growing it,to preparing it, to eating it with friends and family. Danny,her husband and partner in cooking,is a professional chef who makes menus for folks who are not gluten-free, and he attempts to feed those who are gluten-free as well. Shauna's recent blogpost about her family car being stolen in the aftermath of recent national tragedy is an exquisite meditation on what really matters. I feel convinced that Shauna Ahern will become more recognized not only as the fine writer of gluten-free cookbooks,but as a profound voice that teaches us how to deal with extreme life challenges and celebrate mileposts we didn't realize existed. At some point in her career she taught high school English. In spite of occasional perceived slights towards gluten, (or even perceived disparagement of pastry!!) Shauna continues to use words with integrity to inform,educate and delight.
" . . . a Danish made with bleached all-purpose gluten flour looks about as appetizing as a cup of Drano." Hard to believe you'd disparage pastry in this way. Your food issue is not everyone else's issue. In the words of Michael Pollan, "Don't yuck someone else's yum." Didn't you say on twitter that you loved David Lebowitz's gluten-filled adaptation of a recipe? Consistency, please. By the way, I bake gluten free out of necessity due to celiac disease. I'm not disparaging pastry. Some of my best friends are bakers! I'm saying that a Danish looks about as appetizing as a cup of Drano to me. It would run right through me and make me sick. Gluten-filled baked goods lose their allure when they make you sick. Being celiac myself, eating a gluten-filled anything would definitely make me sick. But I enjoy looking at, appreciating the art, and studying baked goods of all kinds. But especially breads and techniques involved in bread making. The gluten free world is a big church. I'm not part of the choir that compares traditional baked goods to poison. We're not asking that you join that choir! Shauna was just making a personal observation, which is something we happen to love about her writing. But Drano aside, please stay for a scone. We'd be happy to have you! I can attest that Shauna's gluten-free pancakes and waffles are so much better than those with gluten. The grains themselves have a wonderful flavor...not bland like flour. Last time I had them, I didn't even want maple syrup! I'd like to find some dark gf buckwheat in Toronto. I found some online from the States but shipping was prohibitive. And, of course, these scones look delicious. I like how very little sugar is used. looks great. any ideas how I could replace the butter and make the scones diary free? I think you are a bit presumptuous in your claim that "most baked goods are better gluten free." Ms Ahern's food issues are obvious. Nonetheless her claim that "most baked goods are better gluten free" was I believe directed at a general audience. Would you rather have a piece of Wonderbread, or a still-warm-from-the-oven piece of crusty focaccia filled with Kalamata olives and aromatic herbs? Wonderbread makes me anemic while Shauna's recipes are both safe for me and delicious. No question about it - follow her blog for a bit and you, too, won't miss "white" flour at all. And you might even decide Shauna is not at all presumptuous. Or, just keep enjoying your Wonderbread and leave the rest for us. Damn, my recipe to do list just got longer. Is this recipe adapted from Kim Boyce's Good to the Grain? That is her technique (I thought super unique) of putting the jam in between layers of dough before cutting the scones into discs. Hilary, it looks like this recipe is adapted from Kim Boyce's Strawberry and Barley scone recipe from Good to the Grain. I thought that I recognized the technique too. Shauna credits Kim on the full recipe page. These look amazing -- csn't wait to try them. Argh, where is the edit button? Meant to say "Can't wait to try them!" Yep, I see that now. I'm glad Kim got credit--it is so unique and I think Good to the Grain is an exceptionally good resource for the gluten intolerant even though it isn't about being GFree--just about pairing flours together to make different flavors. Yes, she did! And we'll add it to the post, too, so there's no more confusion. Thanks for stopping by! I love baking with buckwheat flour! And I love scones. So these are officially on my short list. Thanks, Shauna! Thanks, Shauna! I've been GF for 5 yrs, and reading glutenfreegirl for 5 yrs + 2 weeks. You're an inspiration - Looking forward to this column! So happy to read this! And she really is, isn't she?